The BBC’s new weather forecasts are “severe disappointment” which diminish the size of Britain to show more of Europe, veteran broadcaster Bill Giles has said. Giles, the meteorologist who led the BBC weather team for 17 years until his retirement in 2000, said the new-look weather forecasts at the corporation are “as disappointing as a downpour in high summer”. Advising viewers to change channels, he has laid out a litany of problems from on-screen background to confusing temperature displays, saying the changes were not a good use of licence fee-payers’ money. Earlier this year, the BBC launched a “new modern look” for its weather services, as it entered a new deal with MeteoGroup instead of the Met Office it had worked with for 95 years. Delivering his verdict on the changes, in Radio Times magazine, veteran broadcaster Bill Giles said: “What has happened to our weather? “It’s not the first time someone has asked me – but this query was more pressing because the weather in question was the weather on the television. “Specifically, the BBC’s new weather forecasts, which I have to say, are as disappointing as a downpour in high summer. Spelling out the difficulties he had experience, he said: “For a start the UK map appears a lot smaller on screen now. He added that while some people liked the background colour, he found it “impossible to detect” the difference between cloud and sunshine on screen and does not “for the life of me” understand why night time images have lights on. The habit of highlighting sub zero temperatures with a thin blue line underneath would leave viewers “staring very hard at the screen” to decipher, he said. Regional broadcasts can be even worse, he added, with the old weather maps “better” and “more fit for purpose”. Advising viewers to tune in to Channel 5 instead, praising its “clear graphics”, Giles told the magazine: “Has the BBC’s move away from the Met Office to an independent company ‘to secure the best value for money for the licence payers’ been a success? “I think not. Previously, weather graphics were provided by Metra Weather. They are now produced by the BBC and Meteogroup. 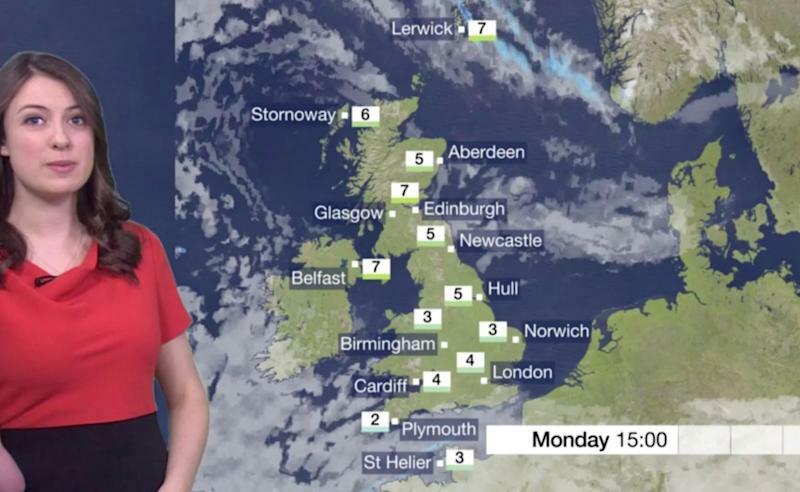 A spokesman for the BBC said: “BBC Weather has a more realistic map which presenters can customise by adding different layers of data to tell the most relevant weather story, as well as zooming in to areas of interest to give a more detailed forecast. "Towns and city names on the maps are a reference point for audiences and we will aim to ensure that most locations are represented over a period of time. "In addition, the temperature colours are now accessible for colour blindness, unlike the suggested blocks of colour by Mr Giles.